I'm seeing a lot of crushed concrete in the material stream of projects these days, mainly as a substitute for crushed stone. I'm a big advocate of this kind of recycling, but its not always a good substitute in all situations. It seems like a no-brainer, right? Hey, we can get crushed concrete for less than crushed stone - lets use it. That's fine, but you really have to think about where you are using it. If you are talking about the layer of stone you lay below a slab on grade for your home, then I think this is not a good place for crushed concrete. The reason gets back to why that stone is there in the first place. The stone bed below a slab serves several purposes. First it creates a "solid" base to pour your concrete over. No soft spots, no roots or organic material to rot away in the future. Second, it allows water to drain through it. The spaces between the stone allow water to flow (and if there is water flowing under your slab it should be flowing to a drain pipe.) Those same spaces between the stone allow you to vent gases coming from the earth like radon. Crushed concrete can do all these jobs pretty well, all but this last one which is: stone provides a capillary break...! A what? You all know what capillary action is - its how your paper towel picks up a spill, how your blood gets through those tiny vessels. In plain speak, any material with tiny tiny holes soaks up water like a sponge, and that includes the soil your slab sits on. So, when a stone layer is placed over the soil beneath your slab, it will prevent the moisture that is naturally in the soil from coming in contact with your slab. The stone has no tiny holes, only big ones, so no suction - the water stops there. Granted, your slab should have a plastic vapor barrier below it, true, but you don't want that vapor barrier to be sitting on top of wet soil. Contact with wet soil only makes it much harder for the vapor barrier to do its job keeping moisture out of the slab. Plus the placement and pouring of a concrete slab is rough work, and the chance that your vapor barrier came through without a hole is pretty slim. A hole plus wet soil would spell moisture in your slab. So believe me, you don't want moist soil right below your vapor barrier. Hence your stone layer breaks the capillary flow of water - water can not rise through the stone, and hence can't approach your slab. And here we have the important difference between crushed stone and crushed concrete. Anybody that has put water on a sidewalk with a hose knows that the concrete absorbs water. You can't see the holes, but they're there. It has a porous structure that takes in and holds water. The crushed stone on the other hand does not. So if you use crushed concrete below your slab, its going to take up that water from the damp soil below, and its going to carry it right up to the underside of your slab - defeating the entire purpose of the stone layer. So, a word of advice. Don't do it. There's plenty of places to make good with crushed concrete in a construction project. Under your slab on grade is not one of them. Continue reading "Crushed Stone or Crushed Concrete"
No matter how familiar I am with a house design, I'm still pleasantly surprised to see it take form in reality during construction. As the siding has approached completion the house is offering up fresh perceptions of its stature and proportions. 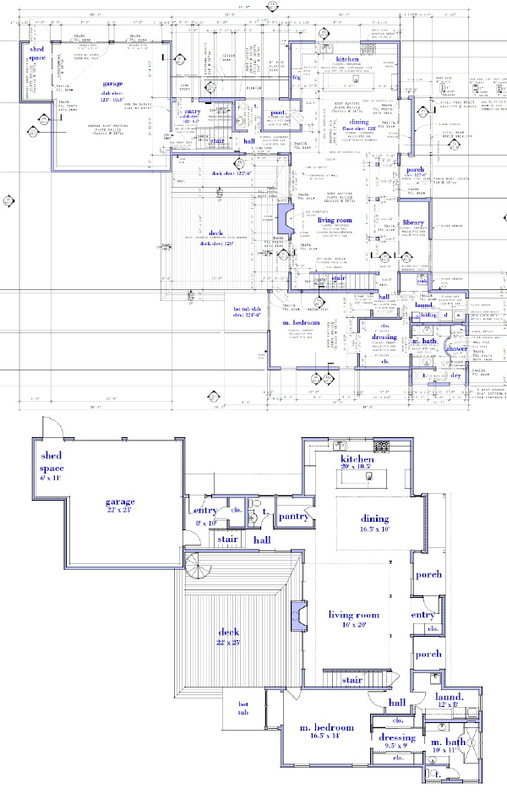 An experience that will continue as the interior is completed as well. The siding panels look to be complete now. 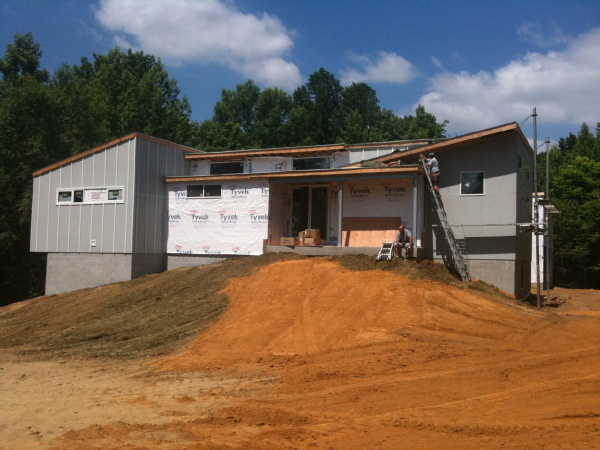 The areas without siding at the entry wing and at the living room will receive stucco. I'm not sure what the schedule for that work is yet, but its outside the critical path for completing other work. It may happen soon, or later. A few more photos have been uploaded to the flickr set as well. 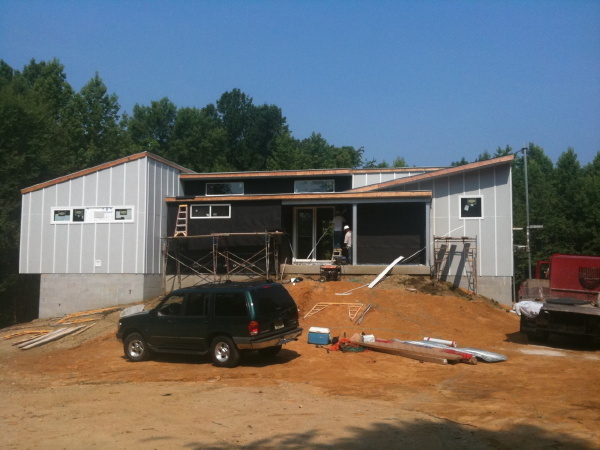 Continue reading "0751 RS House - siding panels complete"
Continue reading "0751 RS House - NJ version vs the two story plan version"
Siding is going up rapidly, and the water proofing now complete earth is being placed around the house. Its finally starting to sit in the ground the way it was meant to. 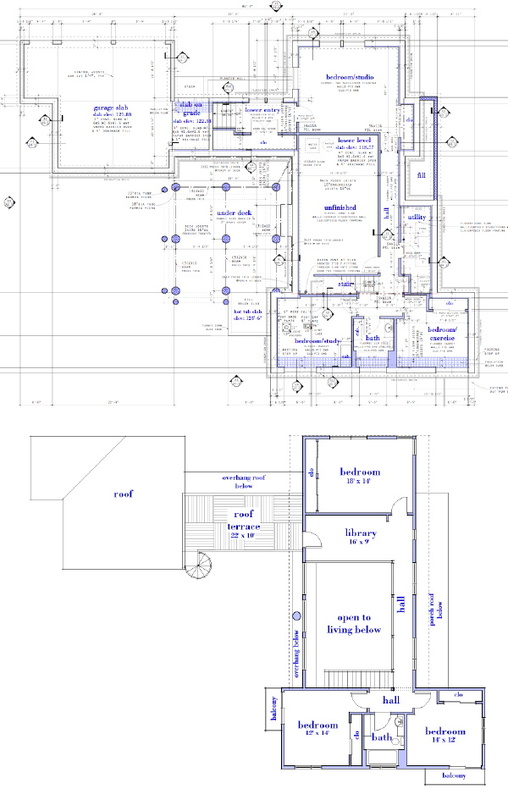 The rough-in of plumbing, electrical, and HVAC is moving along. When they are complete insulation is next. Outside the siding is almost complete. The next steps outside will be stucco and veneer stone. 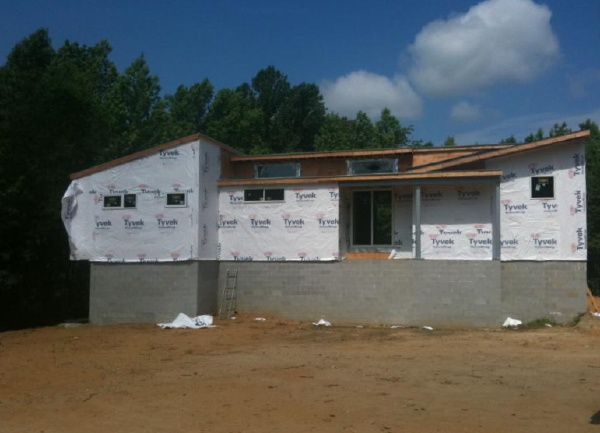 Continue reading "0751 RS House - siding and fill"
While all that water proofing and foundation drain is going on down in the dirt the cladding has begun up on the walls. At the same time wires and pipes are laying down inside and the duct man has his marching orders. It all spells Progress. 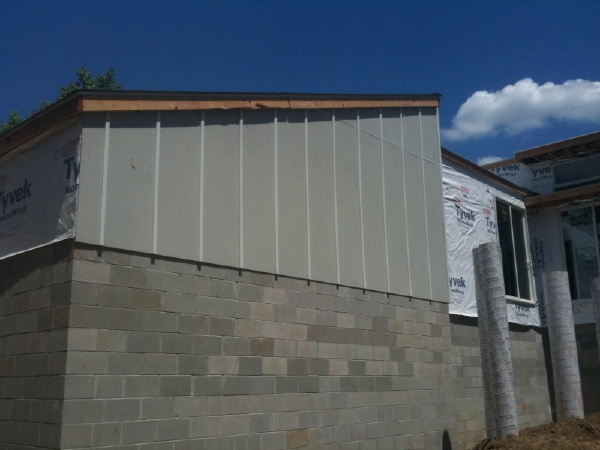 Continue reading "0751 RS House - cladding begun"
Continue reading "0751 RS House - its wrapped"